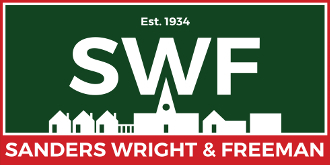 Sanders, Wright and Freeman takes all reasonable care to ensure that the information contained on this website is accurate, however, we cannot guarantee its accuracy and we reserve the right to change the information on this website (including these terms and conditions) at any time. You must therefore check these terms and conditions for any such changes each time you visit this website. The copyright and all other intellectual property rights in the Sanders, Wright & Freeman website including all text, graphics, photos, code, files and links belong to Sanders, Wright & Freeman and the Sanders, Wright & Freeman website may not be reproduced, transmitted or stored in whole or in part without Sanders, Wright & Freeman's prior written consent. However, you may print out, save or download individual selections for your own personal, private and non commercial use.